The APeX Sunday Munch is a social gathering held in a semi-private room of an Albany restaurant. If you’re just looking to join the community, munches make a great first event. Join like-minded people for a delicious meal, make new friends, and learn about what APeX is and what we do. The Sunday munch is held the LAST Sunday (not always the 4th!) of each month from 5 to 7 PM. 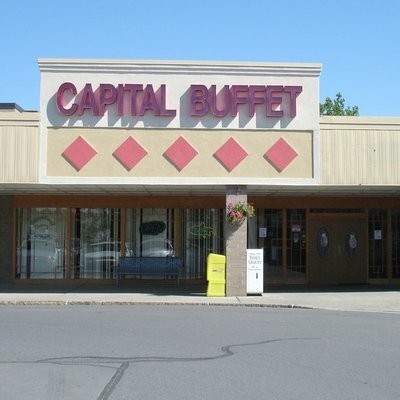 The munch is held at the Capital Buffet on Wolf Road in Albany. [Google Maps Link] We have their back room exclusively for our use for the evening. Cost is $14.00 per person which includes soft drinks and tip. When you enter the restaurant, please pay in advance at the front desk to your right as you enter. Let them know you’re joining the group in the back room. Make sure you get your receipt. Our private room is all the way in the back of the restraunt to the right side through an arched door way. Once you’ve paid, walk back, and say hello to our hostess or host as you enter. Your receipt will be collected, and you can fill out your own name tag so we’ll know how you like to be called. As with all APeX events, you may feel free to use your real first name, a scene nickname, or even to remain anonymous if you’d prefer to get to know us first. No RSVP is required for munches, so feel free to just drop by. Any cancelations or changes are always posted to our mailing list. If you have any questions, feel free to post a message to our mailing list or our Contact Us page.